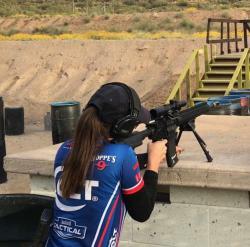 OVERLAND PARK, Kansas – Team Bushnell Tactical Shooter and Hoppe’s Pro Maggie Reese won High Lady in the Open Division at the 2017 Superstition Mountain Mystery 3-Gun Match in Mesa, Arizona. Held March 24 to 26 at the Usery Mountain Shooting Range in Mesa, the Superstition Mountain Mystery 3-gun Match is one of the longest-running 3-gun matches in the country. Reese, a three-time National Champion in USPSA Multi-Gun, had previously won the event in 2009, 2010 and 2014. Competitors in the Open Division can use multiple optics and bipods, with no limit on magazine capacity. Reese paired a Bushnell Elite Tactical SMRS 1-6.5x24mm and First Strike red dot to engage targets close and at distance. “My Bushnell optics and Hoppe’s cleaning solvents were critical for top performance,” Reese said. “I used my Elite Tactical SMRS for targets from 50 to 500 yards away, and the First Strike Red Dot was perfect for all the close range targets we faced under 50 yards. Bushnell and Hoppe’s are both brands of Vista Outdoor. For more information on Bushnell, one of the most recognizable and trusted names in precision hunting, tactical and recreational optics, visit www.bushnell.com. Hoppe’s has earned the reputation as “The Gun Care People” for more than 100 years. For more information on their innovative new line of cleaners visit www.hoppes.com/black.